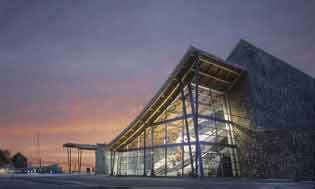 The building, with its soaring, wave-form roofline, houses facilities for education, conservation and research. A $6 million expansion and renovation project has been recently completed. New exhibits will combine history with cutting-edge technology and numerous recent acquisitions. Visitors can expierence what it is like to pilot a tugboat, participate in a Coast Guard rescue on the Columbia River Bar, and live in Astoria during the height of the salmon fishing. Huge windows will make the Columbia River a living backdrop for exhibits that will be more interactive and touchable, many accompanied by interviews with people involved with the events depicted. Here is preserved over 200 years of the rich maritime history of the Pacific Northwest.